A senior citizen walks alone on a quiet street. As the elderly population continues to grow, more cities are turning to innovative new ways to help older residents reconnect with their communities. Life expectancy has been increasing for decades, and the world’s elderly population is expected to more than double – from 617 million to 1.6 billion – by 2050. Helping seniors thrive well into their golden years is one of the biggest challenges that cities face. That includes ensuring that older residents can remain connected to their communities. A number of studies suggest that nearly half of people 65 years of age and older experience loneliness or other effects of social isolation. The risks of loneliness to seniors’ physical and mental wellbeing are only beginning to be understood; by one estimate, loneliness is as damaging as smoking 15 cigarettes a day. 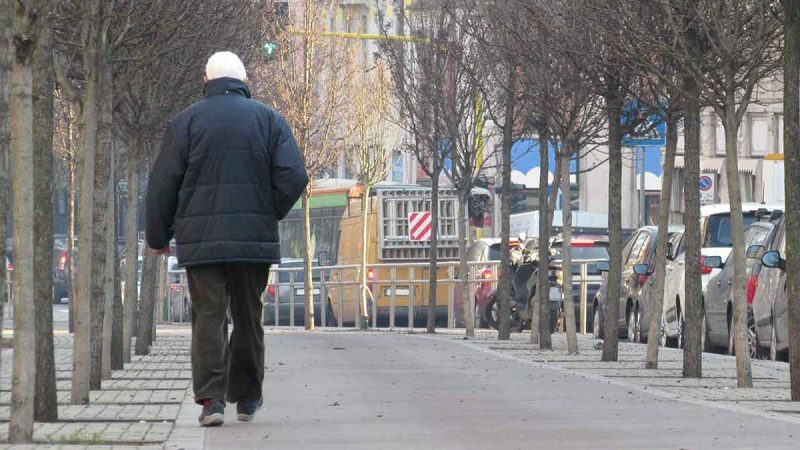 Fortunately, cities around the world are finding new ways to mitigate loneliness and connect older residents to the larger community. Here’s how Bloomberg Philanthropies is helping three cities – Swindon, in South West England; Barcelona, Spain; and Tel Aviv, Israel – tackle this growing crisis. The United Kingdom, like other places around the world, struggles with a loneness epidemic among the elderly; three quarters of older people surveyed in the UK are lonely, and two fifths say that television is their main source of company. As part of its effort to combat social isolation, Swindon, U.K., partnered with Bloomberg Philanthropies-founded Cities of Service and launched Swindon Circles of Support in 2014, a program that connects elderly residents with volunteers from the community. Swindon Circles of Support currently brings together approximately 90 volunteers with more than 100 seniors. Each volunteer receives training in all the different ways they can add to seniors’ lives and are encouraged to volunteer as often as they are able. More than 300,000, or 20 percent, of Barcelona’s elderly residents live alone. One-third of those people are over 80. Many lack the meaningful interactions that play a crucial role in their health and wellbeing. This isolation not only reduces their quality of life, but also increases their risk of developing health complications. To address this, the City of Barcelona, a winner of Bloomberg Philanthropies Mayors Challenge in 2014, created Vincles. Vincles, which means “social ties” in Catalan, is an app-based service designed to strengthen and expand elderly people’s personal and social networks. Armed with the app, elderly residents in Barcelona can connect with two different networks. The first is a “family and friends” network, which includes the residents’ informal support network (family, neighbors, and friends) with formal caregivers in health and social services. The second is the “Vincles user groups” network, which aims to connect older residents with their neighbors, in the hope of better engaging them in community activities. These aren’t only virtual connections, Vincles also facilitates real life, offline meetings between app users and their networks. Launched in January and already active in five neighborhoods, Vincles aims to launch citywide later this year and reach more than 30,000 people, or 10 percent, of the city’s seniors who are living alone by 2020. Elderly residents of the Neve Sha’anan neighborhood in Tel Aviv, Israel are experiencing a different type of isolation. Since 2008, the area’s demographics have shifted from 50 percent Israeli to 10 percent Israeli, due largely to the influx of immigrants from Northern Africa. Residents of all ages have expressed feelings of isolation from their neighbors and report that they do not feel supported by the city. Enter the Tel Aviv Innovation Team (i-team), one of 25 Bloomberg Philanthropies-funded teams housed in cities around the world tasked with bringing new tools and techniques to help solve seemingly intractable problems. As part of its work to improve the quality of life in the neighborhood, team members focused on understanding the challenges residents faced through their own eyes, conducting in-depth interviews among elderly Israeli residents in the area. This ethnographic research allowed the team to deeply understand people’s views of the neighborhood and the challenges they face. The Tel Aviv i-team is just beginning to address the concerns of the elderly Israeli residents, generating new ideas to pilot. One project would repurpose old synagogues as communal spaces for older, long-time residents. Another is focused on reducing the feeling of loneliness among elderly Israelis by pairing them with Israeli students who help the elderly get around the city and accompany them on daily activities, such as shopping trips. While still in the planning stages, the i-team’s work in Neve Sha’anan will ultimately provide insights for communities grappling with similar problems around the world.